The name Isis means �seat� or �throne�. She was regarded as the symbolical mother of the King. In myth, she sought her dead husband and brother, Osiris, conceived her son Horus by him, buried and mourned him together with her sister Nephtys. Isis was regarded as the �Eye of Ra� and was worshipped as the �Great of Magic� who had protected her son Horus from snakes, predators and other dangers: thus she would protect mortal children also. The ancient Egyptians regarded the Goddess as the �Eye of Ra�. 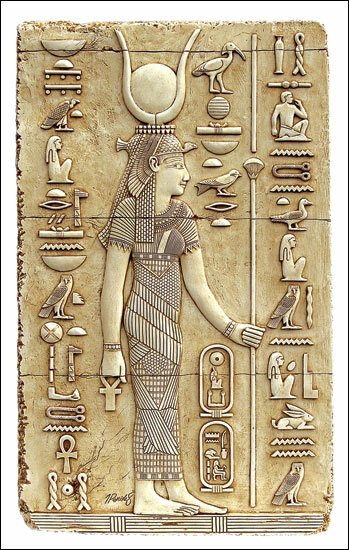 Here she carries the ankh and the papyrus sceptre of Goddesses as well as the horns and sun disk of Hathor. She wears a feather dress and a headdress composed of a vulture, showing that she was identified with Mut.